It’s a heated contest between conservatives vs liberals in the political documentary genre, too. 2016 Obama’s America grossed $26.2M by end of today (give or take some bucks) and passed 4 of Michael Moore’s five political documentaries to become the #2 all-time biggest. Only Moore’s Fahrenheit 9/11, his highly critical examination of the first term of President George W Bush, retains the #1 position with $119.1M. It’s extremely unlikely that 2016 Obama’s America will make even half that. But it now has made more money (not adjusted for inflation or higher ticket prices) than Moore’s Sicko (2007 – $24.5M), Oscar-winner Bowling For Columbine (2002 – $21.5M), and Capitalism: A Love Story (2009 – $14.3M). The right-wing doc 2016 Obama’s America is produced by Gerald R. Molen who in fact credits “learning some lessons” from Moore. “When he released Fahrenheit 9/11 in 2004 ahead of the election, it sparked intense debate.” 2016 Obama’s America also has passed the box office for Al Gore’s and Davis Guggenheim’s An Inconvenient Truth (2006 – $24.1M) and is the #1 biggest-grossing conservative political docu ever (besting Expelled: No Intelligence Allowed’s $7.7M). Based on conservative author Dinesh D’Souza’s 2010 best-selling book The Roots Of Obama’s Rage, it initially opened in only one theater in Houston on July 13th, then expanded to 1,000+ theaters and now 2,000+ locations. by Friday. 2016 Obama’s America is co-directed by D’Souza and John Sullivan and produced by Academy Award winner Gerald R. Molen (co-producer of Schindler’s List). 2016 Obama’s America detractors decry it as a slick infomercial heavy with conspiracy theories. 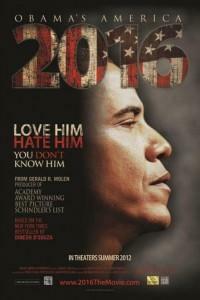 But D’Souza says he made the film to motivate moviegoers to question what an Obama second term would look like. Its success was aided by savvy marketing: exhibitors were reporting busloads arriving at theaters around the country in pre-organized trips. It also employed much of the same selling techniques used to garner attention and support for faith-based films, understandable since the audience is overlapping. Its campaign included advertising nationally on talk radio and cable news channels including Fox News Channel, A&E, History and MSNBC.